Pope Shenouda III of Alexandria died on 17 March 2012. One thing is for sure, this is a sad day for Copts in Egypt and all around the world. Pope Shenouda was a popular figure even outside the Coptic circles for numerous reasons not least of which his witty sense of humor. On top of that, he was a great poet and a well-educated man. I was prompted to write in response to the onslaught of attacks against the Pope. Numerous 'activists' commenting either on Twitter or on Facebook have been slandering the Pope based on his political stances. The main problem with comments condemning the Pope other than being insensitive, which they are, is that they reflect a great deal of ignorance. It is disappointing to see some people narrow minded enough to react to Pope Shenouda III only from a political perspective. It reflects a very shallow outlook on what his passing means. It would be a mistake to think that Coptic criticisms of Pope Shenouda III meant resentment or dislike. 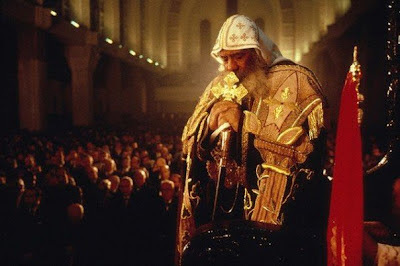 Pope Shenouda was not a controversial figure among Copts, he was a revered and respected leader that garnered much love. In his role as the head of the church, there was great satisfaction and little desire to change him. The criticisms regarding some of his actions meant to bring his attention in order to correct his course rather than a complete rejection of his person and his ideas. There are several surprising facets about attacks on the Pope on the day of his death. The complete disregard for what death means to Egyptians particularly for a revered figure in the Coptic community is one. The attackers have not taken emotions or grief into account and have only examined Pope Shenouda from a very narrow perspective. The entirety of his human life was examined from the perspective of the revolution. In justifying their attacks, some have pointed out that other sinister figures like Tantawi and Mubarak have mass followings who will be upset. To bundle up Pope Shenouda with those names seems like a very inaccurate assessment void of analysis and full of emotion. He certainly collaborated with them and did not oppose them, but one overlooks that his role was not meant to be political and should never have been. Instead of criticizing his decision to play an active role in politics, activists are criticizing the political views themselves. Unlike Mubarak and Tantawi, Pope Shenouda was never charged with running the country. Unlike Mubarak and Tantawi, the Pope did not have blood on his hands, did not order the killing of people, and did not directly block justice. His role was that of a spiritual leader and one must not ignore that main role and focus on a role he forced himself into needlessly. His main duties were to his Church and not to the entire country. He may have done well in one role and not so well in another. In his role as a church leader, Shenouda was loved and insightful. His interpretations and his ideas were full of moderation and preached love. Pope Shenouda's political views left much to be desired and criticism was due but we should not leap from one extreme to another. One incidental aspect of a person is not enough to exalt or vilify a person, just like ignorant or shallow comments about the topic of the Coptic Pope Shenouda III will not exalt or vilify those who said them. Update: I felt I must include this moving piece by Joe Fahim as an example of appreciating Pope Shenouda as a kind and gracious person. Beautifully written and very accurate. I wish everyone in Egypt would read this. Thank you!
" It is disappointing to see some people narrow minded enough to react to Pope Shenouda III only from a political perspective. It reflects a very shallow outlook on what his passing means." Exactly. Although some of his political stances left much to be desired, he was an effective leader that garndered trust among Copts. May he rest in peace. Spot on, common sense always makes sense!